Good oral health is a very important part of your pet’s overall healthcare, and let’s face it- bad breath can make your pet less pleasant to be around. Many owners find it difficult to look closely at their pet’s teeth at home, and thus dental problems go unnoticed. A thorough oral exam by our veterinarians could reveal many issues such as dental tartar, decaying teeth, root exposure, fractured teeth, erosive lesions, discolored teeth that may indicate a damaged root, oral tumors and retained baby teeth to name a few. 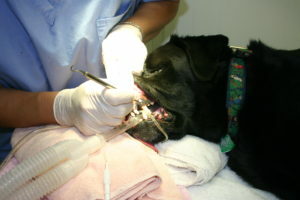 Prevention of dental disease in pets (and in people) requires frequent removal of plaque and tartar. Many pets are already showing signs of gingivitis, plaque and tartar build up by the time they are two years of age! Small breed dogs and brachycephalic (short nosed) breeds often have more dental disease than others (and they are usually less cooperative about home dental care too!). Without daily preventative measures, plaque builds up, calcium salts in saliva build on top of the plaque in layers forming mineralized calculus which then irritates the gums and eventually pushes the gum tissue away from the root of the tooth. Packed with bacteria, the roots and periodontal ligament slowly decay resulting in painful infections and ultimately tooth loss. Bacteria enter the bloodstream from the inflamed dental tissues and can lead to microscopic damage in the kidneys, liver, and heart valves. For pets with dental disease we recommend a thorough oral exam, dental prophylaxis and polish all under general anesthesia. Without anesthesia, plaque and tartar cannot be removed from under the gum line, between teeth or on the insides of the teeth. Safety is our first concern, and for otherwise healthy pets anesthesia is very safe. Dental cleanings are treated like any other surgical procedure; your pet will have an intravenous catheter and fluids, a warming pad to keep him comfortable, and full anesthetic monitoring of vital signs and recovery by a qualified veterinary technician. Keeping your pet’s mouth healthy will improve his quality of life, and possibly yours too!